It’s the new American game show aiming to make a difference in a country where millions of university graduates battle for years to repay the crushing burden of student debt. “Paid Off” offers recent college graduates a glimmer of hope. Go head-to-head each week, answer enough quick-fire trivia questions and possibly have your entire college debt written off with a big fat check. It’s a particularly American problem and one that is growing. 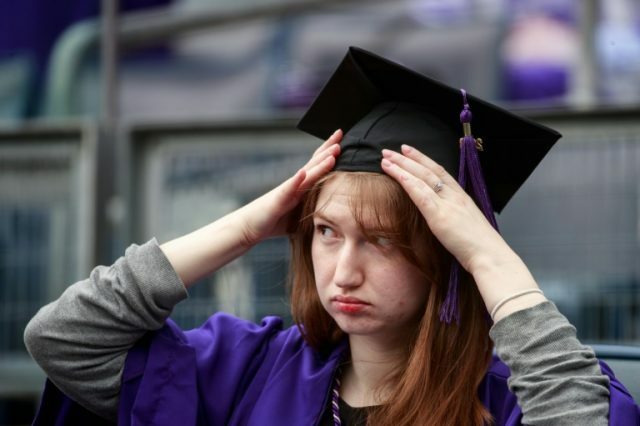 According to the US Federal Reserve, Americans currently owe $1.38 trillion in college debt, a figure that has more than doubled in the last 10 years. “My wife and I struggled with student debt and could only pay it off because — true story — I booked an underpants commercial,” says host Michael Torpey introducing the show. “But what about the other 45 million Americans with student loans? Sadly, there are just not that many underpants commercials,” he deadpans. The College Board, a non-profit organization, says the average cost of a US degree is $34,740 a year at a private college, minus living costs. The majority of the most prestigious universities in the United States are private. Many students borrow either the entire amount or a substantial part. “Paid Off” made its debut on July 10, broadcast on TruTV, a subsidiary network owned by Turner Broadcasting best known for comedy reality shows and for whom recent college graduates are a key audience demographic. While the vibe is light and funny, Torpey — previously best known as an actor on Netflix hit “Orange Is the New Black” — also seeks to raise awareness and hope to enact change. “Student debt is a reality for millions of people and if it takes this absurd game show from Michael Torpey to spark a conversation about it, we’re thrilled to work with him to bring his vision to life,” he said. So far only 16 episodes have been filmed at the Turner Studios in Atlanta. “We’ll see if there’s an appetite for more episode orders in the coming weeks,” says Goldman. A Democratic member of Congress from California, John Garamendi, last fall introduced a bill designed to ease the college debt burden by allowing students to refinance their student loan interest rates and allow borrowers in medical or dental residences and internships to defer payments. To date, the bill has stayed dead in the water.